The Sea of Okhotsk to the north and northeast of Hokkaidō plays no significant role in recorded Japanese history until the second half of the eighteenth century, when clashes began to occur between Russians advancing southward through the Kuril Islands and Japanese settlers trying to drive them back. But from archeological evidence and records from other countries, we can conclude that the Ainu of Hokkaidō were plying the seas and interacting with other northern peoples as early as the thirteenth century—penetrating into Sakhalin, the Kurils, and the Kamchatka Peninsula. In 1263 Kubilai Khan, the fifth ruler of the Mongol Empire, took control of the lower reaches of the Amur River, subjugating the Jurchen and Nanai peoples as well as the Nivkh, who dwelt near the mouth of the Amur and across the strait on Sakhalin. According to the Yuan shi, the official history of the Mongol-ruled Yuan Dynasty, Kubilai’s army conquered the Kugi of Sakhalin a year later, in 1264. The history claims that the Mongols attacked the Kugi when the Gilimi, who had already submitted to the Mongol armies, complained that the Kugi had invaded their territory. Gilimi (吉里迷) was the Sinicized pronunciation of Gillemi, the name that the Nanai of the lower Amur used to refer to a people who called themselves the Nivkh. (The Russians who explored the region in the seventeenth century called them the Gilyak.) Even today there are still approximately 4,500 Nivkh around the mouth of the Amur and in northern Sakhalin. Kugi (骨嵬) was the Sinicized pronunciation of Kughi—the Nivkh name for the Ainu. Among the Tungus peoples of the lower Amur, the name was pronounced Kuyi, a pronunciation that was borrowed into Chinese and written 苦夷 (Kui) during the Ming Dynasty (1368–1644). Approximately 2,500 Ainu lived on southern Sakhalin during the second half of the Edo period (1603–1868). From 1905 to 1945, when southern Sakhalin was under Japanese control, the Ainu population was about 1,500. Until recently, scholars believed that the Ainu had been in Sakhalin since ancient times. But recent archeological research has revealed that Sakhalin was inhabited by the Nivkh in the thirteenth century. These findings, combined with the account in the Yuan shi, suggest that in fact the Ainu were expanding north from Hokkaidō to Sakhalin and pushing the Nivkh northward as they went. The Yuan annals record that in 1265, when the Kugi attacked and killed some Gilimi warriors, the Mongols responded not by force but with offers of food, weapons, and armor. Despite the trouble the Ainu warriors had caused them, the Mongols were at pains to win them over to their side. Soon after establishing the Yuan Dynasty in China in 1271, Kubilai Khan sent out two expeditions to Sakhalin to subjugate the Kugi, in 1272 and 1273, but these apparently failed to make it across the strait. Only after three more major expeditions—in 1284, 1285, and 1286—did the Mongols finally succeed. And despite their defeat, the Kugi again rose up against the Mongols and crossed the Tatar Strait to launch attacks on the Eurasian continent in 1296, 1297, and 1305. Finally, in 1308, the Kugi submitted and agreed to supply their Mongol rulers with an annual tribute in the form of furs and pelts. As we have seen, the Ainu of Sakhalin continued to clash with the Mongol and Yuan armies for more than four decades. According to the Yuan dynastic record, the Ainu were so difficult to subdue that it took a force of 10,000 soldiers and 1,000 ships to subjugate them in 1286. These figures are doubtless exaggerated, but they attest to the tenacity of the Ainu resistance. In 1368 the Mongols were driven from China. The Ming Dynasty (1368–1644) took control of the lower Amur region in 1387, and in 1411 the Yongle Emperor sent a force to establish an administrative office in Nurgan, near the mouth of the Amur River. In 1413 the Chinese built Yongningsi, a Buddhist temple at present-day Tyr, 153 kilometers from the mouth of the river. The temple was destroyed by the Nivkh and other locals, but was rebuilt in 1433. In Nurgan the Chinese also erected a stele explaining the history of the government outpost and temple. According to the stele, emissaries from the peoples of the lower Amur valley and from the Kui living across the Tatar Strait—in other words, the Ainu of Sakhalin—visited the Nurgan outpost and received clothing, tools, and food as gifts from the Ming court. A gift of this nature signified that the recipients had agreed to bring tribute to the Ming outpost. Yongningsi later fell into ruin, but between 1995 and 2000 a team of Vladivostok archeologists unearthed Ming Buddhist sculptures, coins, temple foundation stones, and a large quantity of roof tiles. We owe much of our knowledge of the Ainu in the early seventeenth century to the writings of Jesuit missionaries. The Italian missionary Girolamo (also known as Jeronimo or Jerome) de Angelis came to Japan in 1602. After a number of years in Kyoto and Sunpu, he made his way north to Sendai in 1615, and proselytized widely in the Tōhoku region. In 1618 and 1621 he visited Hokkaidō, then known as Yezo, and wrote two detailed reports describing the people and land of the region to his superior in the ministry. The Portuguese missionary Diogo (also known as Diego) Carvalho arrived in Japan in 1609. After spending time in Amakusa on the island of Kyūshū, he traveled to join de Angelis in Sendai in 1617, and proselytized in the Tōhoku region. Carvalho, too, visited Hokkaidō twice—in 1620 and 1622—and wrote an account of his journey to the “Land of Yezo” in his correspondence with fellow Jesuits. De Angelis stayed in Matsumae, a Japanese castle town at the southernmost tip of Hokkaidō. Here he encountered the Ainu, whom the Japanese called Yezojin, and gathered from them various pieces of information about the Land of Yezo, which he compiled into his reports. In the following I provide a paraphrase of some key passages. De Angelis also writes that Yezojin living in Teshio, in the northern area of Yezo, came to Matsumae in boats, bearing a variety of goods, particularly a large quantity of ornate, finely woven silk resembling Chinese textiles. In his second report, de Angelis included a map depicting the Land of Yezo as an enormous island lying just north of Honshū. The western tip of this island, which corresponds to the Teshio region, lies just across the strait from the Asian continent, presumably either Korea or northeastern China. This may have led de Angelis to assume that the silk textiles brought from Teshio had reached Yezo directly from China. However, since we know that the Kui—that is, the Sakhalin Ainu—received silk robes and similar objects in return for the tribute they offered at the Ming government outpost in Nurgan, it seems more likely that the textiles arrived in Yezo via Sakhalin. Like de Angelis, Diogo Carvalho stayed at Matsumae, where he obtained information about various aspects of Yezo and its people. According to his account, Yezojin from the northeast would arrive in Matsumae by boat after a journey of more than 60 days, bearing soft rakko furs from Rakkojima. They also brought live hawks and eagle feathers that the Japanese used to decorate their arrows. In addition, he wrote that Yezojin from the north came to Matsumae after journeying by sea more than 70 days and brought with them silks of very fine quality. 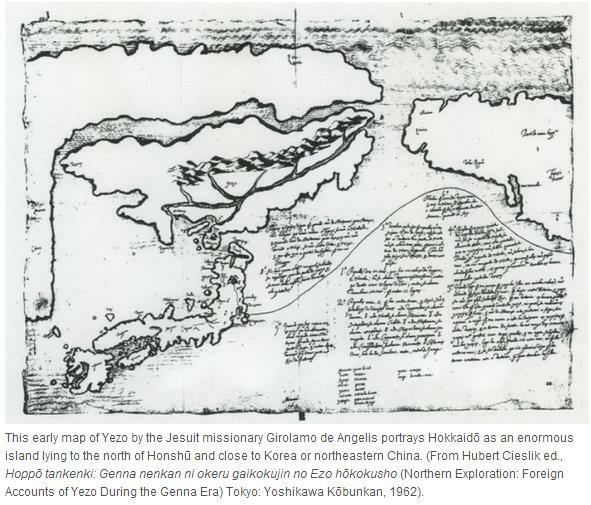 From the accounts of these Jesuit missionaries, we can conclude that the Ainu living in Hokkaidō near the beginning of the seventeenth century engaged in extensive trade, both with the Ainu on Sakhalin to the north and with the Ainu peoples of the Kuril Islands to the east. During the Russian Empire’s eastward expansion in the seventeenth century, Russian explorers and pioneers pushed ever deeper into Siberia, finally reaching Kamchatka around the end of the century. In 1697, Vladimir Atlasov was assigned to explore the peninsula and determine how far it extended to the south. In central Kamchatka, he encountered the indigenous Kamchadal, and at the southern tip of the peninsula he came across another people with different facial characteristics. Atlasov named them the Kuril, but it seems safe to assume that these, too, were Ainu. Atlasov reported on his expedition when he arrived back at Yakutsk, the Russian government’s major Siberian outpost, located on the middle reaches of the Lena River. In his report, he indicated that boats reached Kamchatka from islands to the south, bearing pottery, cotton textiles, and other goods to the Kuril on Kamchatka. When the Russian government realized that there were islands south of Kamchatka, it ordered the outpost at Yakutsk to explore them. In 1711 Ivan Kozyrevsky arrived at the first island, Shumshu, and in 1713 he landed on the second, Paramushir. On Paramushir he met native islanders and also, by chance, encountered a non-native by the name of Shatanoi, a trader from the island of Iturup far to the south. Shatanoi was identified with the people whom Atlasov had dubbed the Kuril—that is, the Ainu. From Shatanoi, Kozyrevsky obtained detailed information about the islands to the south, which provided the basis for the report he submitted to Yakutsk. The report gives a vivid picture of the lively commerce carried out by the Ainu across an early eighteenth-century maritime trade network spanning the southern tip of Kamchatka, the Kuril Islands, and Hokkaidō. The first island, Shumshu, is inhabited by the Kuril. Kuril from the southern islands travel there and take back with them sea otter pelts, fox pelts, and eagle feathers for arrows. The second island, Paramushir, is also inhabited by Kuril. Kuril from the remote islands come here as well, bearing silk and cotton textiles, swords, pots, and ceramics. Kuril also live on the third island, Onekotan. People from this island sail to Kamchatka to buy sea otter pelts and fox pelts and take them to the far southern islands. The people of Onekotan also know the language of Kamchatka because they trade and intermarry with the Kamchadal. The men marry Kamchadal women, and they also marry off their daughters to Kamchadal men. The fifth island, Shiashkotan, also trades with Kuril who come there from the southern island of Iturup. This fifth island is a kind of meeting place where people of the northern and southern islands gather to trade with one another. The inhabitants of the far southern island of Urup travel to Kunashir to their south, where they buy silk and cotton to trade for sea otter pelts, fox pelts, and eagle feathers on Paramushir and Shumshu. Farther south is Iturup, whose inhabitants travel all the way to Kamchatka to trade. [This information was doubtless obtained directly from Shatanoi.] The people of Iturup are the same as those the Japanese refer to as Yezojin. Farther south is the island of Kunashir, where traders from Matmai to the south come in small boats to sell silk, cotton, and pots in exchange for live eagles and eagle feathers. The people of Kunashir frequently travel to Matmai to trade as well. Matmai is the fifteenth and last island, and it is larger than all the others. It is inhabited by Yezojin, or Kuril. On the southwestern coast of this island is a town called Matmai, built and settled by the Japanese. In Matmai, the Yezojin buy Japanese-made silk and cotton textiles, swords, pots, and lacquer ware, which they bring to Kunashir and trade for sea otter and fox pelts and eagle feathers. Clearly, the town of Matmai was the Japanese settlement of Matsumae, and the island of Matmai was none other than Hokkaidō itself. 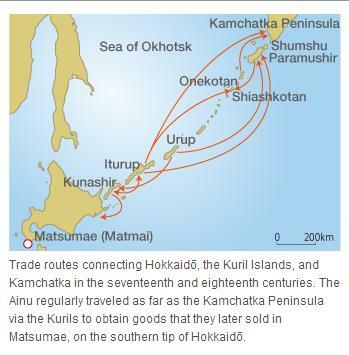 From Kozyrevsky’s report it is clear that the Ainu lived all along the Kuril island chain in the early eighteenth century, and that their trading activities connected Hokkaidō not only with the Kuril Islands but with Kamchatka as well. Moreover, the accounts of de Angelis and Carvalho suggest that this trade dates back at least as far as the beginning of the seventeenth century. De Angelis also mentions the appearance in Matsumae of two visitors from an island near Rakkojima, speaking a language different from that of the Yezojin. On the basis of Kozyrevsky’s report, they were most likely Kamchadal, the native people of Kamchatka. This provides further evidence of the lively inter-ethnic movement and commerce around the Sea of Okhotsk during the seventeenth and eighteenth centuries, interaction in which the Ainu played a crucial role. Thank you Dion, yes I like it too. This is interesting. Was told that the nearest language to Basque was Ainu. Since the people speaking these languages are now as far apart as they can get – Basques being in Northern Spain by the Atlantic and Ainu by the Pacific, this seems to indicate origins somewhere for both and others with related languages somewhere in the middle of the continent. What other connections between them and other people have been discovered. Hi Heather, I made a reply on Linkedin. Previous Post A firsthand account of vice and profit in Edo – Book review.